It has been some time since I wrote something about BlueTooth Low Energy. I think that the last post that I wrote was the ones about development for Garmin sports smart watchs. 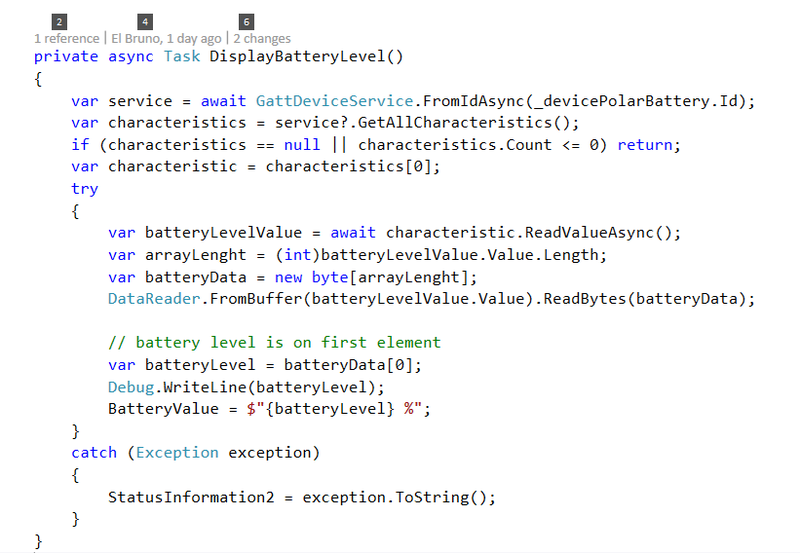 While working with BlueTooth Low Energy devices is common and easy with iOS and Android, with Windows it was somewhat hard. If you work with Xamarin, in the old days we have Monkey Robotics as a common platform to use some BLE features in different projects. But at the end, the best way to work was implement some native code in each platform. 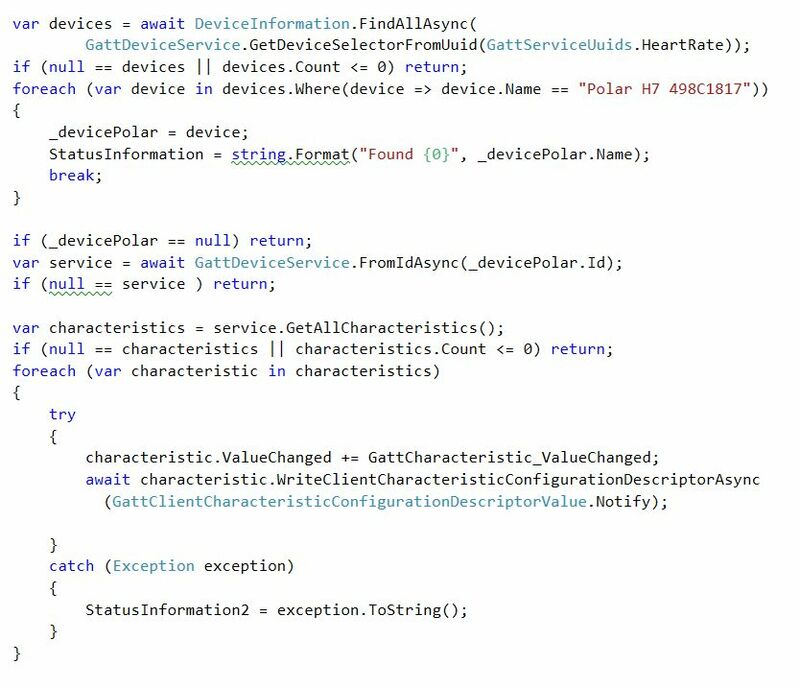 A few days ago I find out that Adrian Secelenau (xabre), has released a package of Xamarin BLE based on Monkey Robotics, which could be considered version 1.0: Xamarin BlueTooth LE. For example, if we create a project for example Xamarin, we see that we can add this package in 2 steps. We also as we see in the image above also have support for MvvmCross, I know that it is something that will make happy more geeks MVVM as Javier Suarez (@jsuarezruiz) and Josue Yeray (@josueYeray). As well, surely more forward can migrate / write some example more full for test the package in depth, by now I can tell that the implementation is quite clean and that them examples of code are very useful. For example, here we can see how simple that is accessing the local BLE, check the status of it and subscribe to the DeviceDiscovered() event. The process of installation in Toronto is taking shape. While I continue with the steps necessary to live here, I give me the luxury of jogging at – 10 ° C to learn a little. Best of all this, is that the past February 14, Pao gave me a Garmin Forerunner 235 to replace my M400 Polar, already a bit old. After giving some kilometers to the legs, I began to know the ecosystem of Garmin, the truth is that it has left me quite stunned. In addition to its sports capabilities based on own sensors as the Heart Rate, GPS, etc. ; the smartwatch is a BLE connection constant with the smartphone. When vi BLE, began to see whether there was the possibility of doing “more” with the Garmin. I gave a good taste, when I got to the Connect IQ SDK, which is the basis for developing apps for Garmin devices. As in all these cases, I didn’t expect to do anything, but I’ve taken me a pleasant surprise: Connect IQ SDK supports Windows, Android, and iOS. Now my next step is to use Visual Studio 2015 as development tool, which is going to be some kind of weird. I’ve just found that the programming language is Monkey C. Which is something completely new for me. I have seen that it is a mixture between Java and C, which can give me many fun times. As well, to see that I can get the Garmin. And even compare it with other SmartWatchs who worked with their SDKs, such as the Microsoft Band and the Pebble. El proceso de instalación en Toronto va tomando forma. Mientras sigo con los trámites necesarios para vivir aquí, me puedo dar el lujo de salir a correr a -10ºC para conocer un poco. Lo mejor de todo esto, es que el pasado 14 de Febrero, Pao me regaló un Garmin Forerunner 235 para reemplazar a mi Polar M400, que ya un poco viejo. Después de darle un poco de Kilómetros a las piernas, empecé a conocer el ecosistema de Garmin, la verdad es que me ha dejado bastante asombrado. Además de sus capacidades deportivas que se basan en los sensores propios como el Heart Rate, GPS, etc. ; el smartwatch tiene una conexión BLE constante con el smartphone. Cuando ví lo de BLE, comencé a ver si existía la posiblidad de hacer “algo más” con el Garmin. Me dí un buen gusto, cuando llegué al Connect IQ SDK, que es la base para desarrollas apps para devices Garmin. Como en todos estos casos, no esperaba poder hacer nada, pero me he llevado una agradable sorpresa: Connect IQ SDK soporta Windows, Android e iOS. Ahora solo me queda ver como montar los proyectos con Visual Studio 2015. Porque, no lo he comentado, el lenguaje de programación es Monkey C. Algo completamente nuevo para mi, y que he visto que es una mezcla entre Java y C, que puede darme mucha alegrías. Pues bien, a ver que puedo sacar del Garmin. E inclusive compararlo con otros SmartWatchs con los que trabajado con sus SDKs, como la Microsoft Band y el Pebble. I’m going to share a couple of posts on Xamarin and Beacons in the next few days. I’m going to use Estimote for the first posts. So, today I realize that some beacons run out of battery. So, a normal tech dude will throw them out. Me, on the other side, think to open them to see what’s inside (I know, bye bye warranty). But I was shocked when inside the beacon I found a … Millennium Falcon !!! En los próximos días escribiré un par de posts sobre beacons y Xamarin. 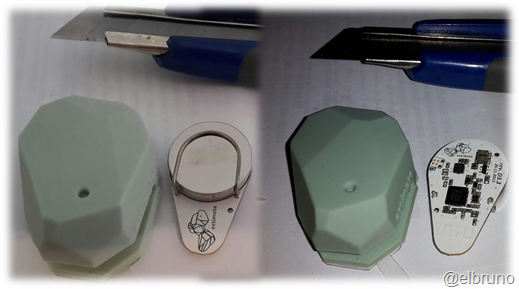 Los que utilizaré para los primeros ejemplos serán los de Estimote. Hoy cuando revisaba alguno de ellos me he dado cuenta de que no tenían más batería. Y claro como son descartables, se me ocurrio ver que tenían dentro (además de perder la garantía automáticamente). Lo que más me sorprendió fue que dentro tienen … un Millennium Falcon !!! 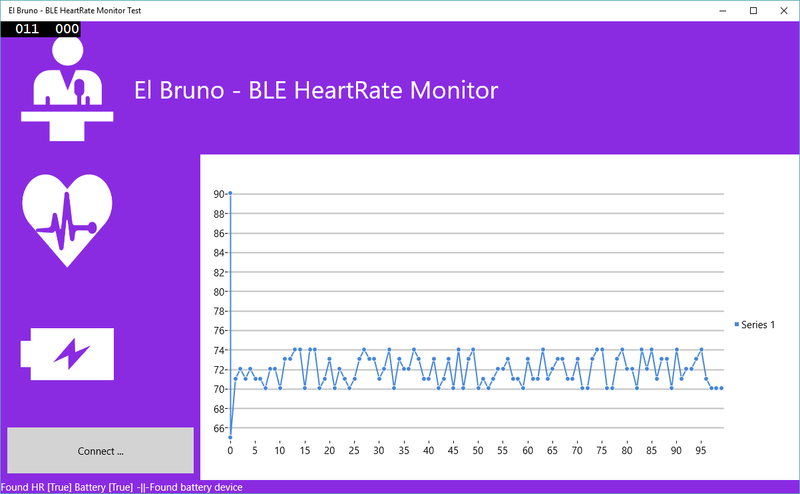 In my previous post, I wrote a series of steps to create a Windows Universal App and using this app read information from a Heart Rate Band. This band also exposes the battery charge as a characteristics, so we need to update our package manifest to read this value. Now we can really Start to have an app displaying all this information. El siguiente paso es obtener el valor de la carga de la batería. A diferencia del post anterior, en donde recibíamos los valores en un evento, en este caso accederemos a la característica del device y leeremos el valor de la misma. Esto ya nos permite tener una app donde se muestren los valores del Heart Rate y la carga de la batería. 4. Once we found the device, is time to get the device service. This BLE Service is the entry point for the characteristics of the device. This device is simple enough, and based on our settings it only publish Heart Rate information. So let-s subscribe to the ValueChanged event and enable the Notify mode. Next one, a full app interacting with the polar device.